We started using cold laser at our Southport clinic 8 years ago. We needed something at our clinic that was more than just the standard treatments that just were not getting the results we wanted. We needed something to treat those problem conditions that just weren’t responding to conventional standardised treatments. Something to treat those difficult conditions such as severe neck degeneration, chronic migraines, tennis elbow or plantarfasciitus. After much consideration and research as to how we could best help our patients with their wide range of conditions we invested in cold laser.- “It has been a revolution at our clinic and our patients now rely on their cold laser treatments to minimise recovery time”. In a 2009 study involving 820 patients with chronic neck pain. Low level light laser therapy reduced pain significantly for up to 22 weeks after the treatment had finished. Nerve Research Foundation, Brain and Mind Research Institute, University of Sydney, Sydney, NSW, Australia. INCREASED METABOLIC ACTIVITY: Laser Therapy brings higher outputs of specific enzymes, greater oxygen carrying capacity. Basically food for cells. RAPID CELL GROWTH: Laser Therapy accelerates cellular reproduction and growth. ANTI-INFLAMMATORY ACTION: Laser Therapy reduces swelling caused by joint inflammation and injury. STIMULATED NERVE FUNCTION: Damaged tissue often has slow recovery of nerve function. Laser Therapy speeds up the process of nerve cell reconnection to repair damaged tissue and improve nerve function. 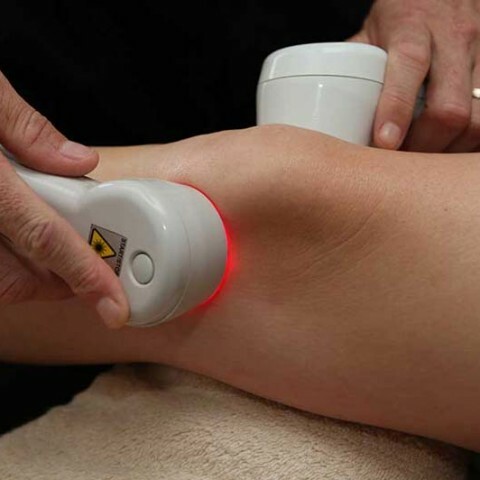 REDUCED FIBROUS TISSUE FORMATION: Laser Therapy reduces the formation of scar tissue following injury. Patients often prefer this method to dry needling or acupuncture, as it is painless and less obtrusive. The technique is called “cold” laser therapy because the low levels of light are not enough to heat your body’s tissue. The level of light is low when compared to other forms of laser therapy, such as those used to destroy tumours and coagulate tissue. Very safe, very effective. Using the latest heat/thermal imaging techniques (Diagnostic X-rays if required) we isolate the site of your problem. We establish what the likely cause is, and how long it has been present. We also identify what soft tissue structures have been damaged. After we gather this information we are able to guide you in what treatment options will be most beneficial for your specific condition. Nearly all our patients experience very positive outcomes from cold laser therapy at our clinic. Not only a quick reduction in painful symptoms but also reports of better sleep, more energy, and even more stable moods are all common feedback we hear from our patients on a daily basis. We have been using laser at our clinics for 8 years with outstanding results. If you have been living with pain for too long give our office a call today and get on the path to recovery. You could be one of our great success stories.